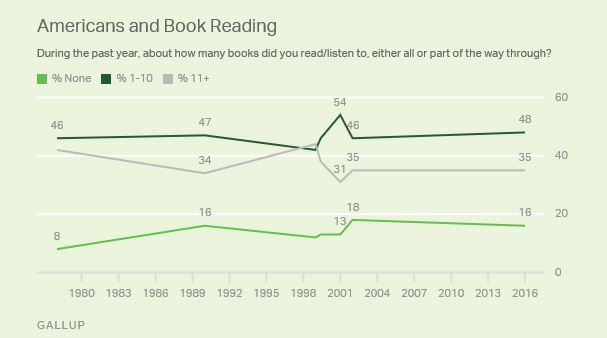 A recent Gallup survey revealed that most Americans are still reading books at about the same rate as they were in 2002, before digital diversions like smartphones and social media became popular. More than 1 in 3 adults (35%) can be considered “heavy readers,” meaning that they have read more than 11 books in the past year. Close to half (48%) of the respondents reported reading between 1 and 10 books in the past year, and less than 1 in 5 (16%) adults surveyed did not read any books. Respondents across age groups reported a similar amount of reading, with the youngest and oldest adults reading slightly more than middle-aged adults. About 9 in 10 (91%) adults aged 18-29 reported reading at least one book in the past year, and out of that group about 2 in 5 (38%) report reading more than 10 books in the past year. Out of older adults (aged 65 and older), more than 4 in 5 (85%) reported reading at least 1 book a year, and about 2 in 5 (37%) read more than 10 books a year. Middle aged readers (30-64 years old) are not far behind, with 4 in 5 (81%) also reporting that they read at least one book in the last year, and a third (33%) reporting that they read more than 10 books. When asked whether they read mostly printed books, electronic books, or audio books, survey respondents overwhelmingly preferred print books. About three-quarters (73%) indicated that they primarily read print books, while 1 in 5 (19%) read e-books on a tablet or e-reader, and a small group of readers (6%) mostly listened to audiobooks. For more information on reading trends, you can find the full report here.